Mink wrote: Heh, I was all excited about that too, Litude, but going back through the thread, you can see stienrays is a sneaky probably-soon-to-be-spamming-bot thing that only splices together other people's words. Goddamn, has to be the first time I actually got fooled by a bot. Is there a patch for making Episode 6 version 1.5 into version 1.4? I can't play AAMBA with my current version. Does anyone know what the difference (if any) is between version 1.93 rev 1 and the id Anthology version of Keen Dreams? The only difference is that some of the included text files that can be read at start-up have been updated with some other info. And calling that version the "id Anthology" version isn't entirely correct either since it's the same thing that you could purchase from the Softdisk store a few years back. A whole lot of these 'how can I get version such-and-such' and 'what is the difference between version herp and derp' can be answered yourself by a quick trip to the slightly illegal Keen Collective located at zapzot dot net. 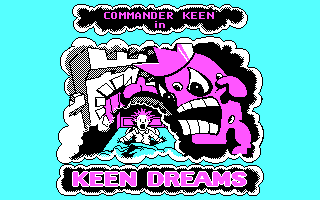 - Is there CGA version of Keen Dreams existing? - Are there any official patches for Keen 4, Keen 5 and Keen 6 that moves CGA versions to EGA? Anybody, please share anything you know about this. Thanks. Why not just use the EGA Keen 4? Or have you been modding the CGA version? Thank you very much for your answer. If I got it right, this 1.05 CGA is able to be patched to EGA version, isn't it? I'm asking this because I want to be very strict about finishing every game in the franchise and this brings me to strict separation of different version of same game and different games at all (I'm talking not only about Commander Keen here - for example, Sid Meier's Pirates! and Pirates! Gold, or C&C and C&C Gold (Windows 95) are questionable enough from my opinion). So I've decided that dividing line is in the following - if official patch converting original release into questioned one exists - than it's just the latest version. If such patch doesn't exist then original release and questioned one are different games. So by this logic if CGA to EGA patches for Keen 4, 5 and 6 exist I will play only EGA versions. If they do not exist, I will like to finish both CGA and EGA versions for each game. I hope I'm clear enough with my point of view, thanks for reading the whole message. Great article and whole site by the way. But I can see that for example Keen 4 Steam version is not mentioned here. Is it just because they have same 1.4 Version bundled with DOSBox? I've never used Steam, but my understanding is that no special edition was made for Steam. It's probably just the latest EGA version. As for patching CGA to EGA, I'm afraid I can't help you sorry. I'll see if I can message someone who might be able to help. I had thought that the two were relatively incompatible as the graphics files are fundamentally different. The games play in the same way, though, so the actual code shouldn't differ much at all. And if you're just seeking to play the games, shouldn't just playing the non-patched CGA version be the "purest" way to do it? EDIT: I've had an idea; have you tried swapping the EGA bitmaps in the EGA version for the CGA bitmaps from the CGA version? You see, I'm trying to play the latest version of a game always (because I believe this is the version developer finally wanted people to play). But when it comes to remake of a game then I wouldn't say it is the latest version - it is whole new game already. And now I'm trying to distinct EGA Commander Keen from CGA one - if they are different games or just EGA is advanced version of patchable CGA version. I think I could try monkey-patch with bitmaps but it will prove nothing until there exists official patch converting CGA to EGA. I've found some more on about my question. Here: http://rome.ro/smf/index.php?PHPSESSID= ... #msg106430 a guy named "Apocalypse Gohan" is listing all the patches of CK he found and I can see some patches that are switching the graphics. But in the beginning of the tread he is asking for CGA CK5 in order he could make a patch himself, so I wonder what patches from his list are official and what are not. Unfortunately registration on that site is closed and I have no way of contacting him. Ok now guys, I have got final list of questions that bother me. Keen 2 from 1.0 to 1.31 - is it official or self-made? Keen 3 from 1.0 to 1.31 - is it official or self-made? Keen 5 from any version to 1.4 - is it official or self-made? Keen 5 from any version to 1.4 GoodTimes Software release - is it official or self-made? Keen 6 from 1.0 to 1.4 - is it official or self-made?, does it work for both CGA and EGA? Keen 6 from 1.4 to 1.5 - is it official or self-made?, does it work for both CGA and EGA? Keen Dreams from 1.0 to 1.92 rev 0 - is it official or self-made?? Keen Dreams from 1.92 rev 0 to 1.93 rev 1 - is it official or self-made?? Keen 1 - do you happen to know if there are any official patches to 1.31 version? Keen 4 - do you happen to know if there are any official patches to 1.4 version? Keen Dreams - is there any official patch from shareware 1.01 to 1.13? Thanks to everybody for participating, this information is really of big value for me. All the Keen patches are unofficial. Id Software didn't create patches until Doom. Although there's a patch for updating Wolfenstein 3-D v1.1 to v1.2 created by Apogee. I think that the revisions ARE official!